I spent the past two days guiding a great group of guys. We had occasional rain on Friday, but we had a steady drizzle all day today. Friday, Zach hooked into a really big fish that gave him a memorable fight, only to lose it because the hook straightened out. Ted hooked into a few half-pounders and landed one very nice wild fish. Today, Tommy hooked into a very nice fish that put up quite a battle, but he too lost his right as I was attempting to net the fish. Ted fished very hard both days, and was finally rewarded with a beautiful hatchery fish at the end of the day. 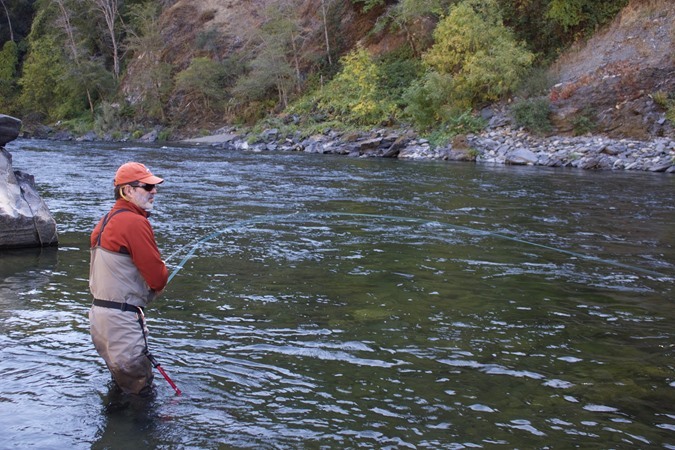 There are fish in the river and for now, there is very little fishing pressure. 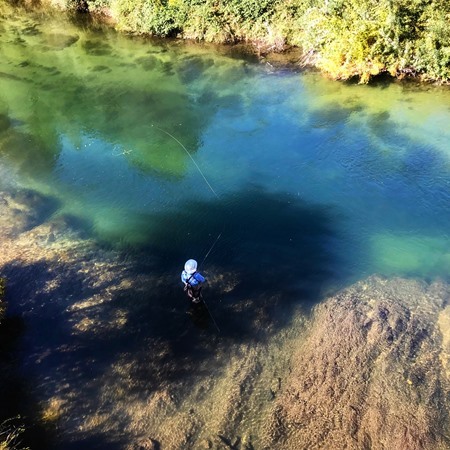 The water is low and clear, so I feel conditions will improve once we receive some rain. I guided Mike and Warren from Chico today. The morning started off very productive with both hooking into some really nice fish, but then there was a long lull in the action. Fishing started to pick up again in the afternoon, but overall it was a tough day. A storm system is passing through and that could have had a negative impact. I'm still not seeing any salmon on redds yet, but they are eating egg patterns and nymphs. Mike always seems to find the big ones! 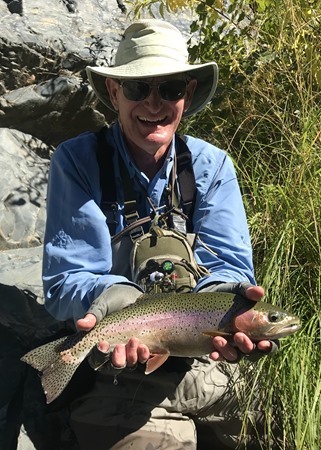 Warren with a beautiful fish! 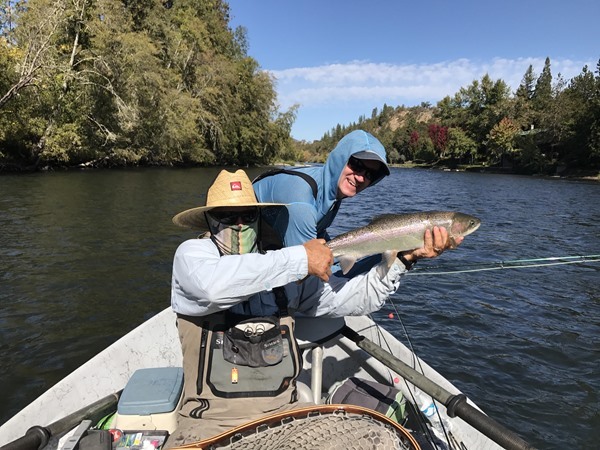 The Lower Klamath is fishing fair/good with a mix of 1/2 pounders and adults to 4lbs, I jumped a couple of chrome bright steelhead in the 8-10 lb range in a tailout making there way up river. 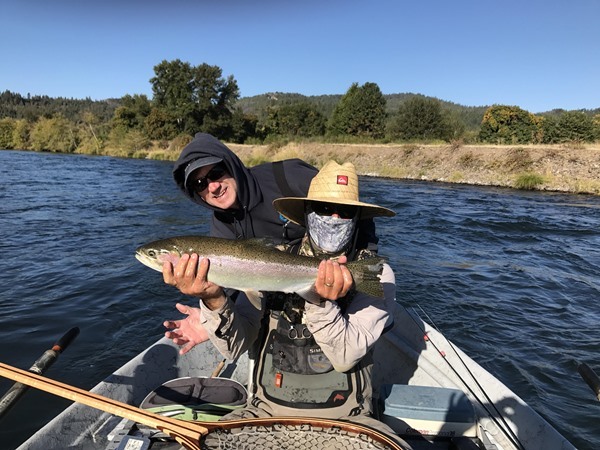 The mouth of the Klamath is open and fresh Steelhead continue to trickle in, the numbers are down from the average but the pressure on the Lower Klamath is almost nonexistent resulting in some pretty darn good fishing at times ! 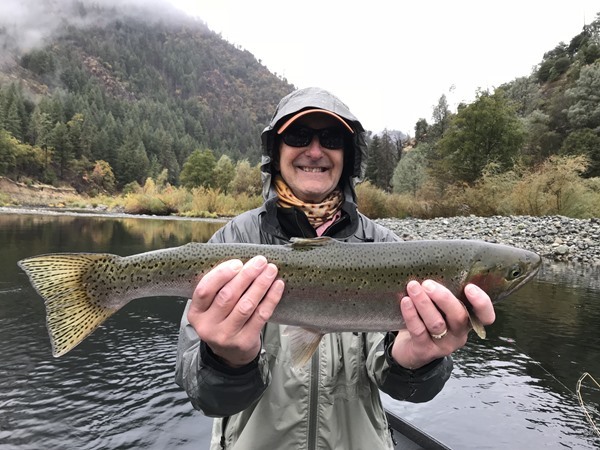 as well as being some of the best swing water in the Lower 48 !The fishing on the Trinity is similar, a fair number of steelhead, the overall numbers are down but the size is up from typical. 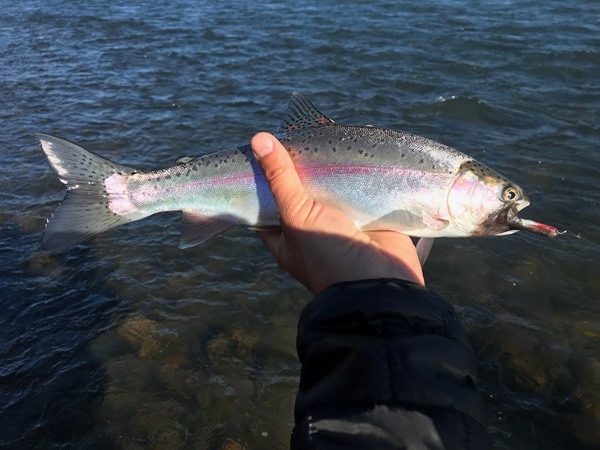 The Feds have trapped and released some fairly large Steelhead at the weir in Willow Creek recently.The Swing fishing on the Lower Sac is better then normal for this time of year for wild Rainbow's and a mix of Wild and Hatchery Steelhead. With a lack of Salmon on Red's the fish don't seem to have there typical October tunnel vision of feeding almost exclusevly on Salmon Eggs. I got out on the river for a few hours today with fellow guide Randy Hamann. 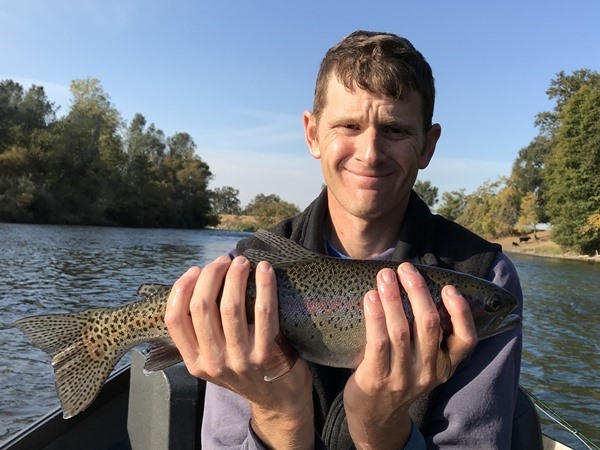 There are a lot of nice fish to be caught on the Lower Sac right now. 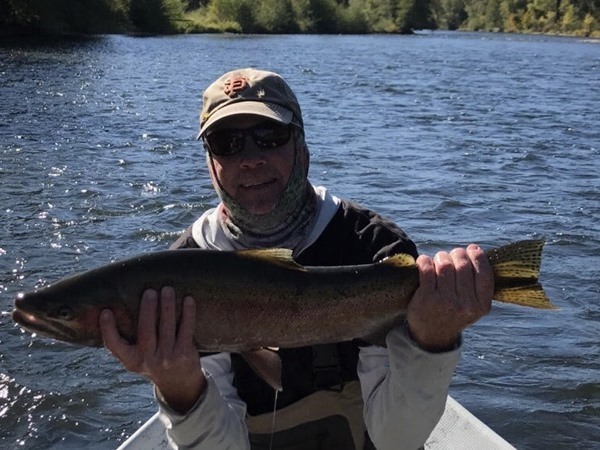 "Coleman" steelhead, meaning fin-clipped steelhead that originate from the Coleman fish hatchery on Battle Creek, are fairly thick in the river this year. 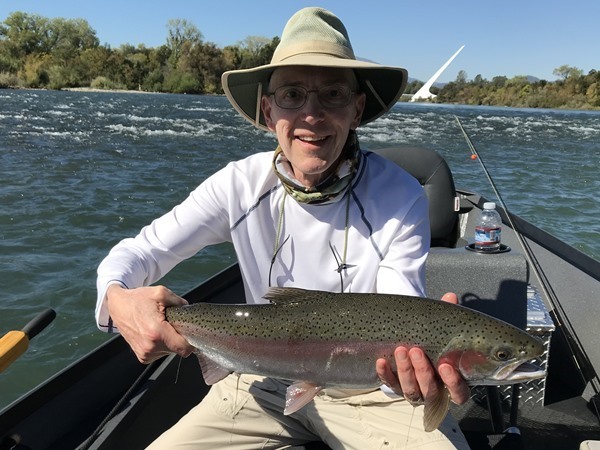 Our guides have been catching them from Red Bluff all the way up to the Sundial Bridge in Redding. Most of these fish are in the 3 pound range, but we've hooked some up to 5 pounds. I lost a big one today that tore off line and jumped its way to the middle of the river. These fish are good eaters and come well to the swung (or even stripped) fly and the dead-drifted nymph. 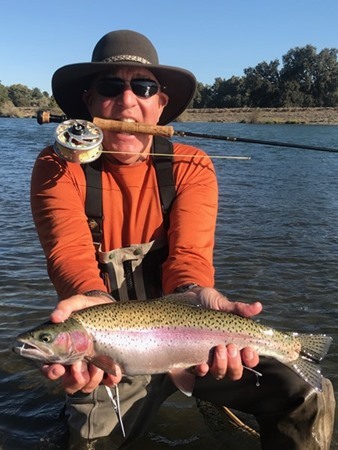 Our eBay auction for Opening Day is now live: http://www.ebay.com/itm/Opening-Day-at-Eagle-Canyon-Private-Fly-Fishing-for-Trout-near-Red-Bluff/122746205016The auction concludes at 4pm on Sunday. Starting bid is $1160, which is our regular price for a fully-guided group of 8 anglers. Opening Day is December 9th 2017. I had the pleasure of guiding Karl and his father Dave again today. It was game-on from the beginning when Karl hooked into several really big fish early on. 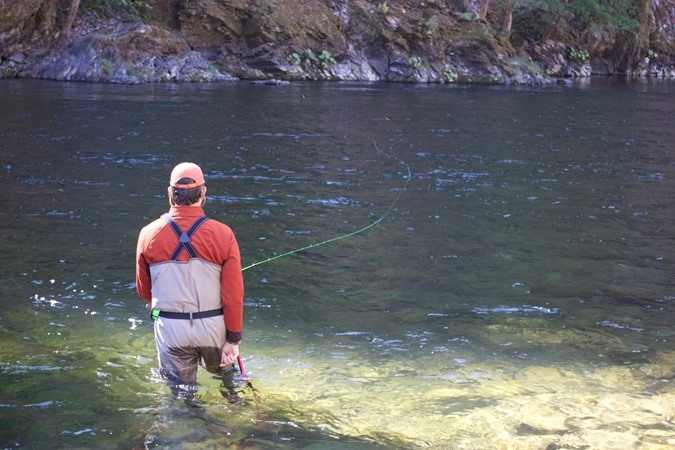 The fishing was fairly consistent all day and it seemed like we had the river to ourselves. 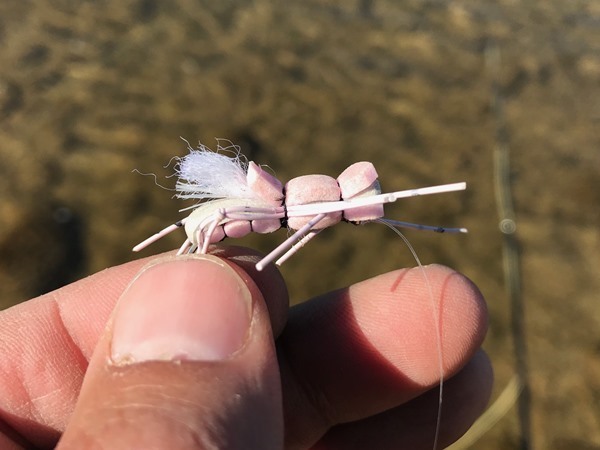 The temps are ideal and the fish are really starting to key on egg patterns, but rubberlegs still seem to produce the most fish. Karl with another beautiful fish! The fish were pretty tight-lipped today, very different from yesterday. Roger and Brian fished hard and lost out on some great opportunites, but also capitalized on some as well! We didn't land many fish today, but the ones we did were pretty epic. All the fish came on rubberlegs, egg patterns, or mayfly nymphs. Brian with an absolute horse! I spent the last two days swinging flies with return guests Steve and Jim. We used the jet boat to get around and wade fished some very nice water. Fishing was very good despite high winds both days. 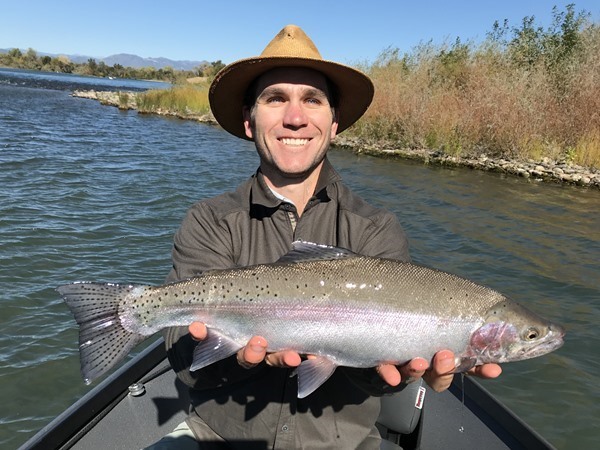 We caught most of our fish on standard trout nymphs fished on short leaders behind either an intermediate or fast-sink versileader. 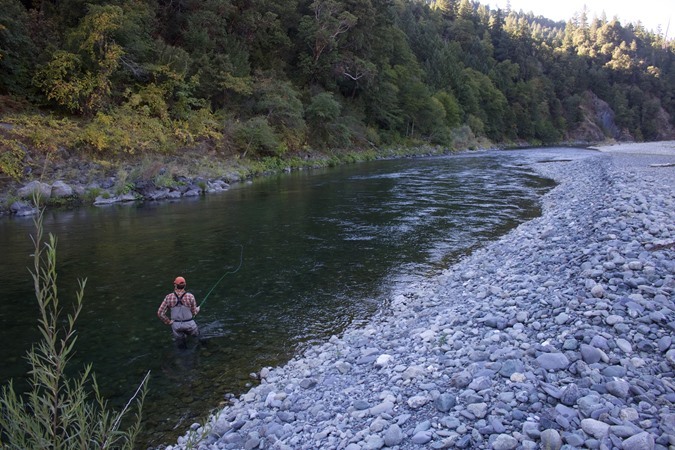 We fished everything from 3wt trout speys to 7wt single-hand rods set up for single-hand spey casting. I even threw my dry fly rod for a bit and had some good action on dries and dry/dropper setups. 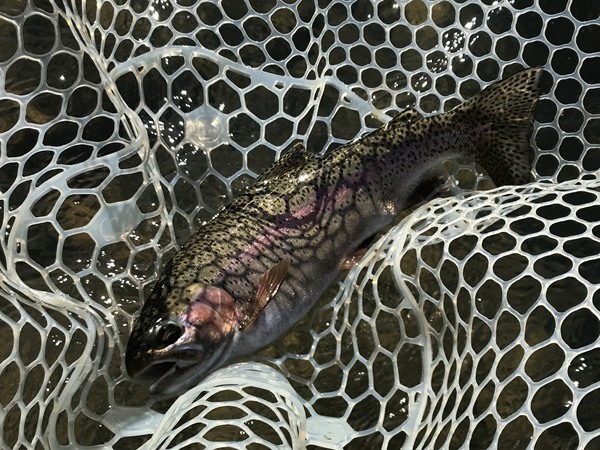 Two days with no indicators and we managed to connect with a lot of great Lower Sac fish. Lower Sac fish sometimes do eat streamers! I had a great time guiding Jamie and Ryan today. 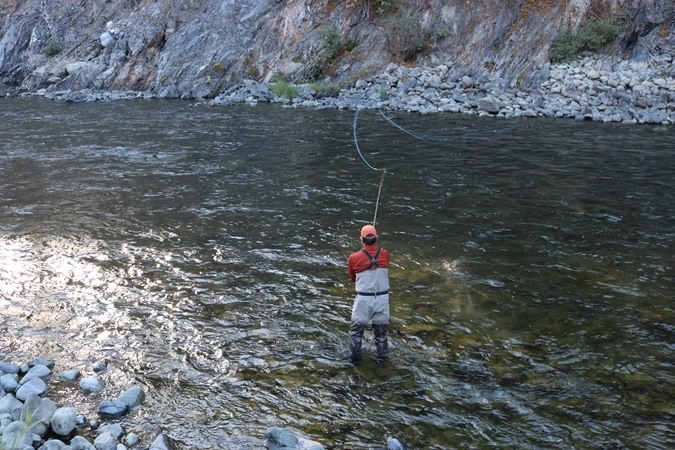 The Sac remains a bit challenging, but we are hooking into some really nice fish! They are eating eggs, rubberlegs, and small mayfly nymphs. The weather is perfect! I spoke with Bill and Caryl Dickens (Gold Coast Shuttle Service) today regarding shuttles below Junction City. There is still one-way traffic control in place from Junction City to Big Flat, so they are only able to complete a limited number of shuttles below J.C. This is due to road construction to repair the burned timbers that retained the roadway and hillside at Screech (Lime Point). 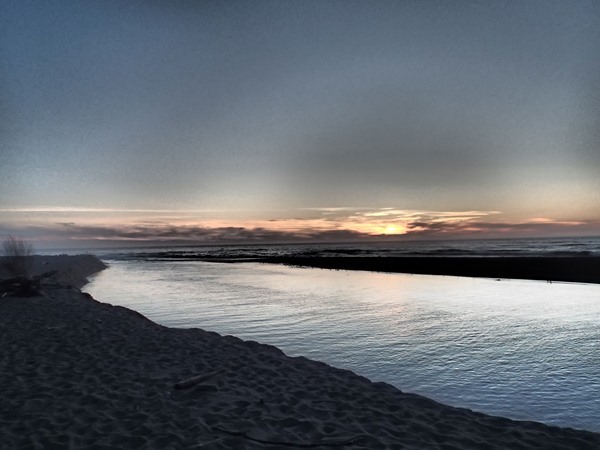 The construction should be completed next week (20th), so the traffic controls will be lifted and they will have no restrictions on shuttles down to Pigeon Point. The extended forecast is calling for rain and showers begining Thursday - this is very good news. 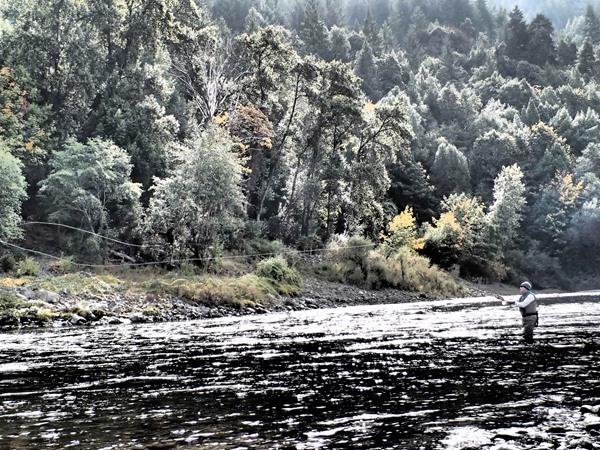 Now is the time to book your fall and winter steelhead trips on the Trinity! Bob with a beutiful wild hen from last season. Tommy with really nice hatchery fish from last season. 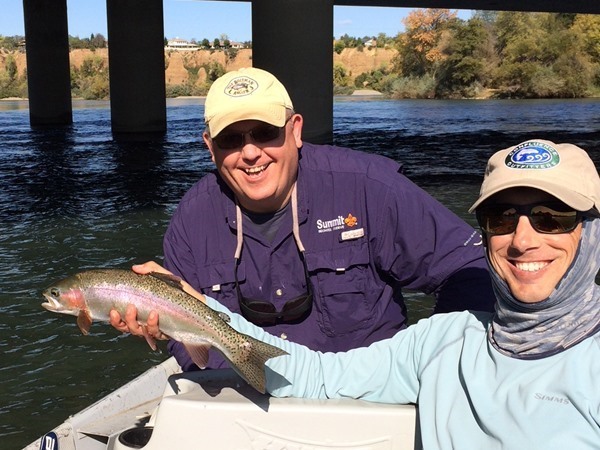 I fished the Lower Sac with Al and Joe from the Bay Area today. Despite a complete lack of spawning salmon, the river fished well for us. 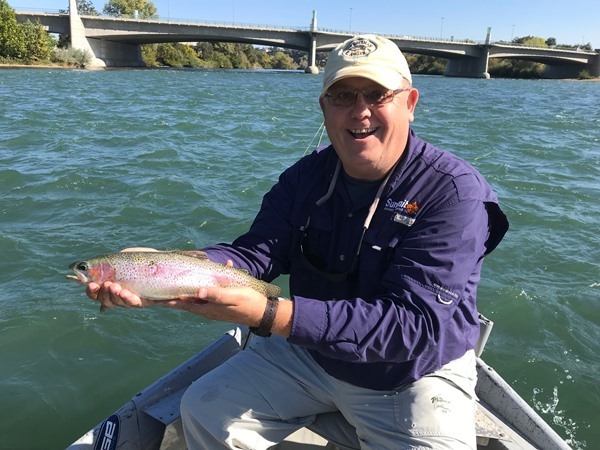 We hooked good numbers of 10-15" rainbows plus a few fat 18" fish. Fishing pressure was really light for this time of year. There was a good hatch of baetis mayflies in the afternoon and I even saw a nice fish eat one on the surface before I spooked it with the boat. 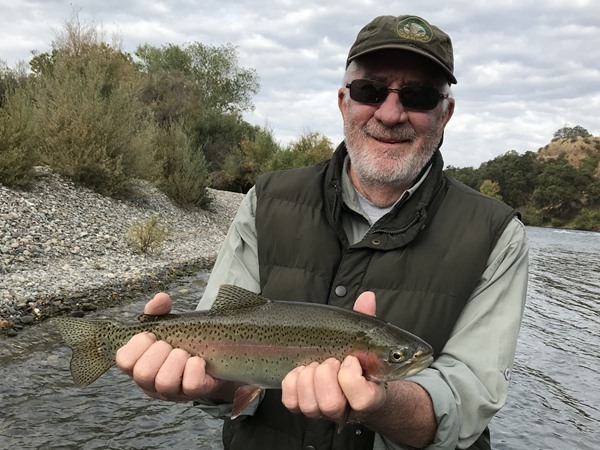 It hasn't been a good year for dry fly fishing on the Lower Sac so it was nice to see a good rise. Peter Santley has been on the Trinity this past week. 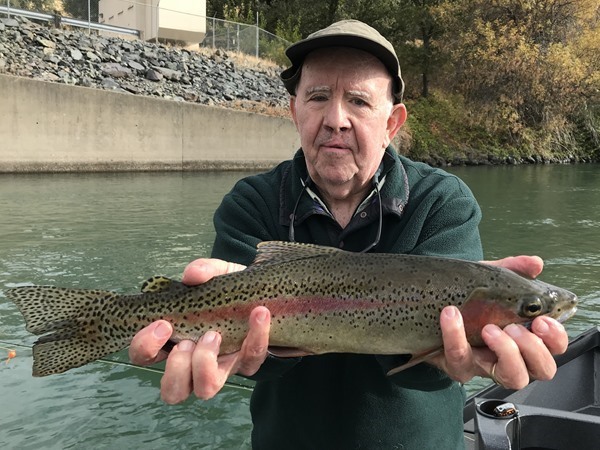 Here is a report:"Trinity fishing has been good at times, slow at times typical steelhead fishing. We have been getting fish both swinging and nymphing. Some real hot fish! Good mix of large smolt and half pounders too. A mix of hatchery and wild fish. 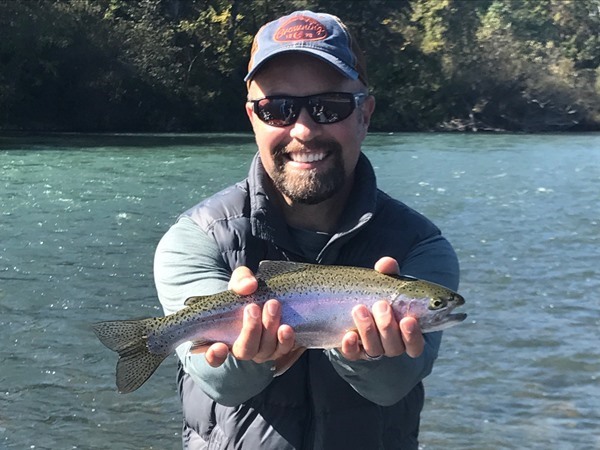 We've had some egg bite action below spawning salmon for some exciting fishing hooking fish in less than 2 feet of water. Boat traffic has been light so far. Highway 299 is restricted to one lane traffic from JC Campground down." I just finished a 5-day run on the Lower Sac. Given the crazy flows from this past winter, it seems the new norm is - pretty darn good one day, not so good the next day. And that is exactly how the past five days played out. I am seeing more salmon rolling, but haven't seen any on redds yet. But, the fish are really starting to key on egg patterns. My clients haven't been blessed with big numbers, but they are getting into some REALLY big fish! Monday and Tuesday we landed a few in the 21-23 inch range, but yesterday took the cake! 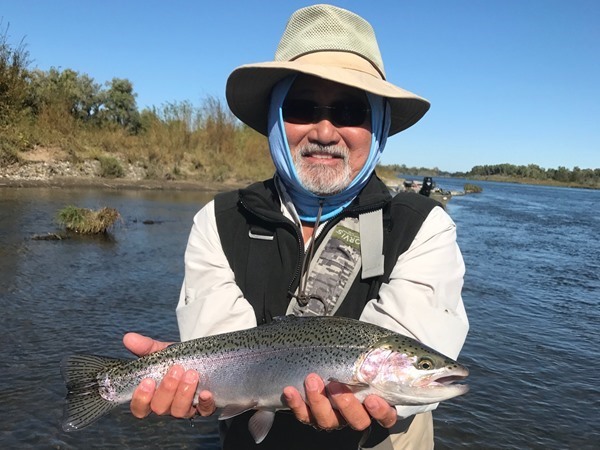 We knew Burt was into a really nice fish, but after an epic 15 minute battle, he landed the largest hatchery steelhead I've seen on the Sac! Today was another day of big fish. Some cooperated, some didn't. As more salmon make there way to spawn, I expect the fishing will only continue to improve. 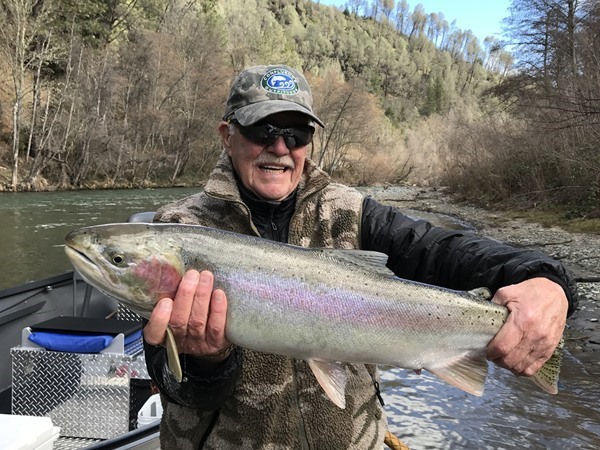 Burt with the largest hatchery steelhead I've seen on the Sac! Tom with his nicest of the day! 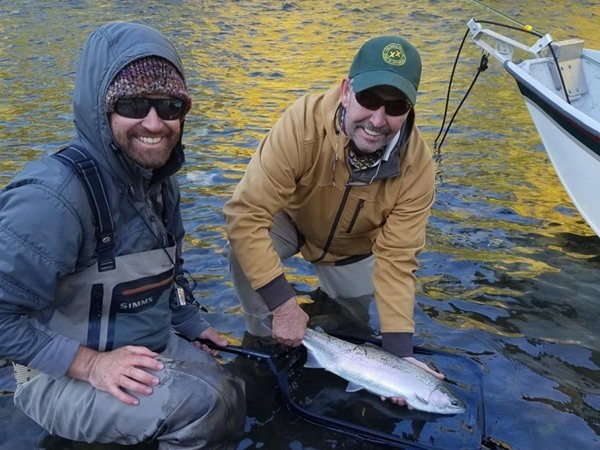 Here are some photos from guests Steve and Jon who fished the Upper Rogue the last three days with guide Steve Eadie. Nice fish, guys! Had a great day with Brad from San Jose today on the Trinity. We did the float from Hawkins Bar down to Willow Creek. We started off skating flies hoping to find a player early on. 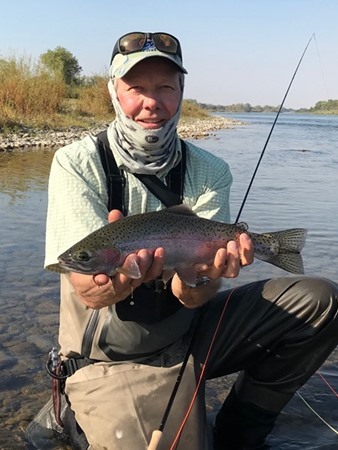 Switching to an intermediate tip and soft hackle paid off when Brad came tight to a fish in the second run of the day; A nice half pounder that ended up giving us the fin. 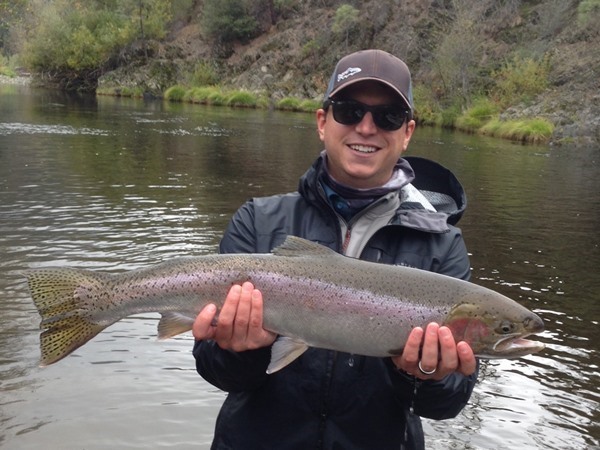 We saw good numbers of adult fish from the boat, but never ended up bringing one to the fly. I will say this, there are some big fish making their way up the Trinity right now. An encouraging sight to see. We rounded out the float with Brad going 3/3 on half pounders in the last (best) run of the day. The Trinity isn't on fire yet, but she's warming up. First sun on the water. 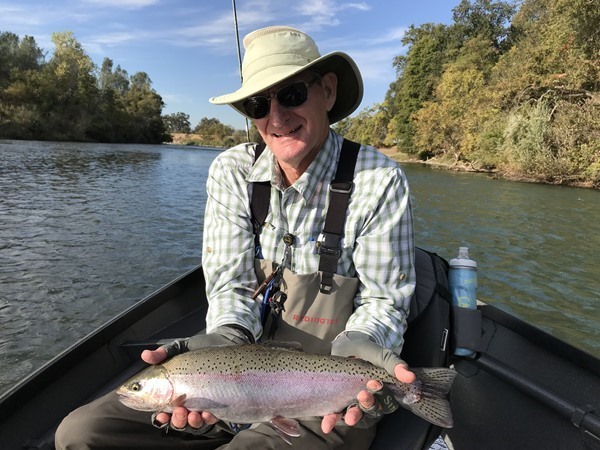 Northern California: Oct 6, 2017, by Sam: Awesome day! Had a great time today showing Tom some local "top secret" fishing spots on foot. Caught fish on both nymphs + dries! 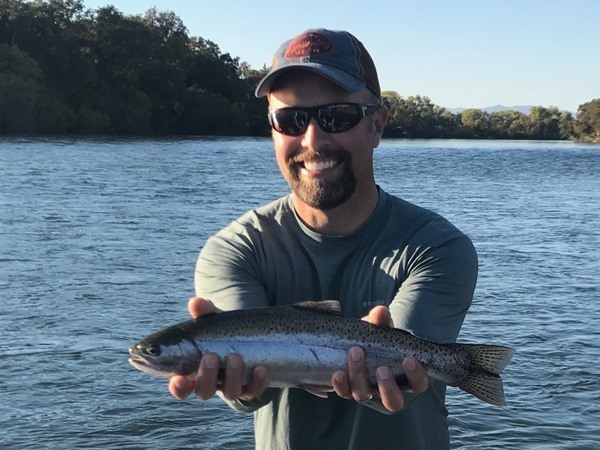 Northern California: Oct 5, 2017, by Andrew: Fish with a Buddy! We have two groups looking to split a fishing trip next week. 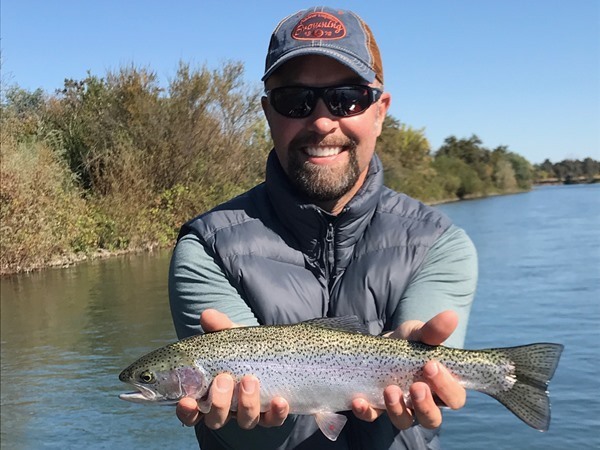 Fall is in the air and this is a great time to get out on the water, especially when you can split the cost of a trip with another angler! The first is a Lower Sac trip on October 13 and 14. It's a nymph/indicator drift boat trip including shuttle. Total price to split the boat on this trip is $475 for the two days. 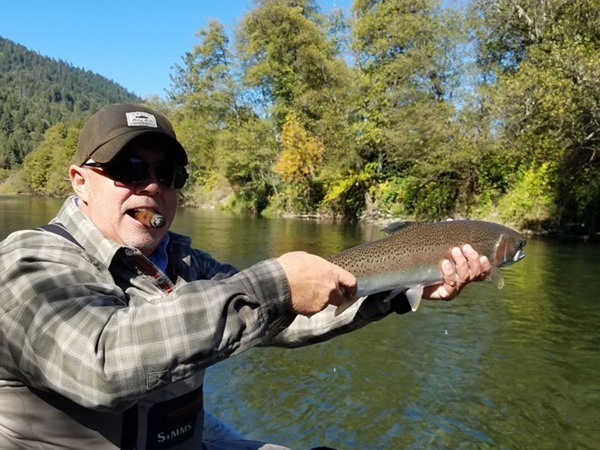 The second is a spey-only jet boat trip on the Lower Klamath River on October 15th with guide Randy Hamann. There are already two anglers on this trip, but they're open to being joined by a 3rd angler. The price to join this trip would be $250. Fore more information, visit our Buddy Finder page on our website. Things are starting picking up on the Trinity. Make sure to check road conditions before you head up there, lots of road stops. 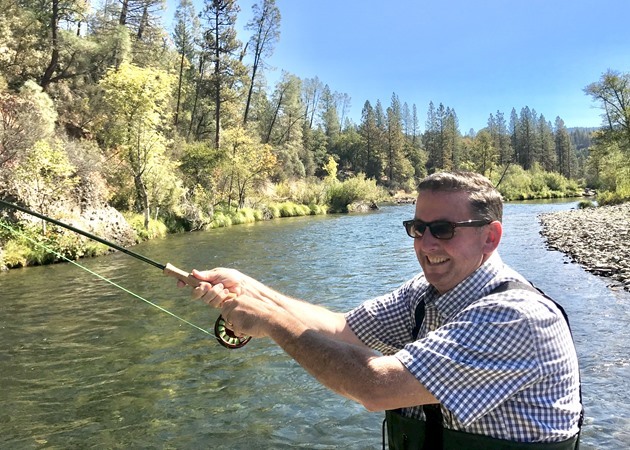 Brian w his first fish ever on a fly rod! Had a good time with Tom and Derek fishing Hat Creek and the Pit. Lot of Trico's hatching. Derek got the first day fish of the day (one of his first on a fly rod)!